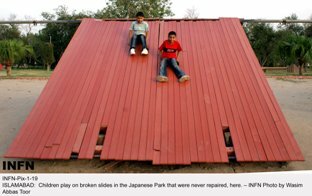 ISLAMABAD July 19, 2010: Established in 1985 as a gift from Japan for Pakistani children, the Japanese Park -- also known as Play Land -- has been a favourite spot for people of all ages but is currently in a deplorable state for want of maintenance. “We do not know anything about repairs, but we work very hard to maintain the rest of the park. We get a daily wage of Rs233, with no day-off. We do not have any machinery or equipment either,” responded a worker who was rolling a huge log of wood on an extremely hot and humid day. Assisted by other fellow workers, these men were using bare hands to accomplish the tedious job. The park’s supervisor, Ghulam Saghir, also reflected on the dedication and hard work required to maintain the park, particularly its green areas, plants and trees. “I have 28 ‘maalis’ (gardeners) here who also work as sweepers and even as security guards,” he revealed. Saghir recalled that the then CDA chairman Kamran Lashari visited the park in 2008 and constituted a committee to suggest and execute a comprehensive plan for repair and maintenance of the swings, slides and other installations. “A letter was written to the Japanese embassy to obtain assistance for repairs as the equipment and installations are made of a specific material that is not available in Pakistan. The representatives of the embassy visited the park but nothing happened after that,” he stated. Niazi said that the directorate allowed joy land operators into the park because with the slides and swings all damaged, there was no entertainment left for children. When questioned about absence of security within the park, he stated: “Except for Lake View Park, no other park has any sanctioned post of a security guard.” Leaving public parks at the mercy of mischief-mongers, that too in a country beset with daunting security threats, defies all common sense.